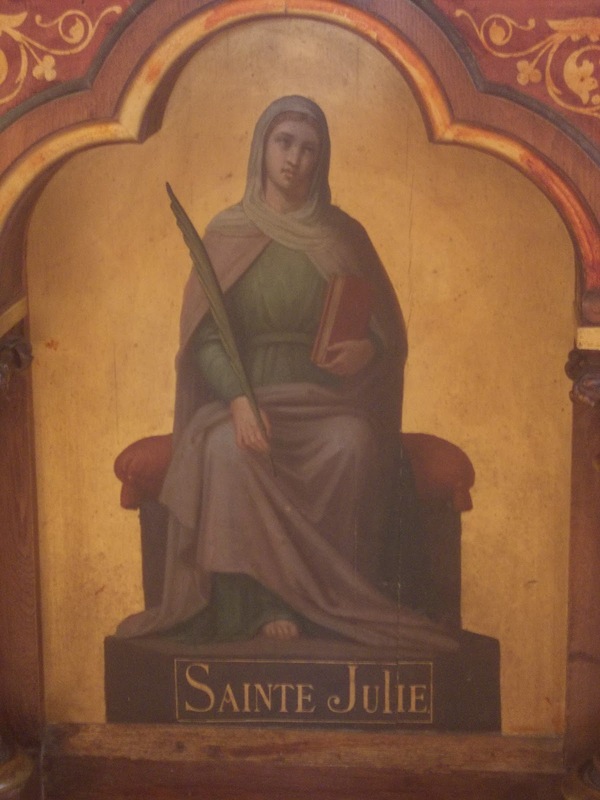 For all the Julies out there. This is your saint day! This image is from a piece of artwork at the church in my adopted hometown of Thomery, France. Shock from a murder attempt on her father left her in bad health for many years. She spent 22 years completely paralyzed! During the French Revolution, she harbored loyal priests in her home. This made her a target, and resulted in her fleeing in secret three times in five years to avoid exposing her friends. Around this time, she had a vision of Jesus surrounded by a large group of religious women dressed in a habit she'd never seen before. A voice told her that these would be her daughters and that she would create an institute for young Christian girls. She and a friend then founded the Sisters of Notre Dame de Namur. In 1804 she was miraculously cured of her paralysis and began to walk again. About ten years later, she nursed wounded and starving affected by the Battle of Waterloo. She was canonized by Pope John Paul VI in 1969.